June 27th, 2017 Taipei, Taiwan – Cryptocurrency mining has once again found revitalized value thanks to skyrocketing cryptocurrency prices now reaching record highs. 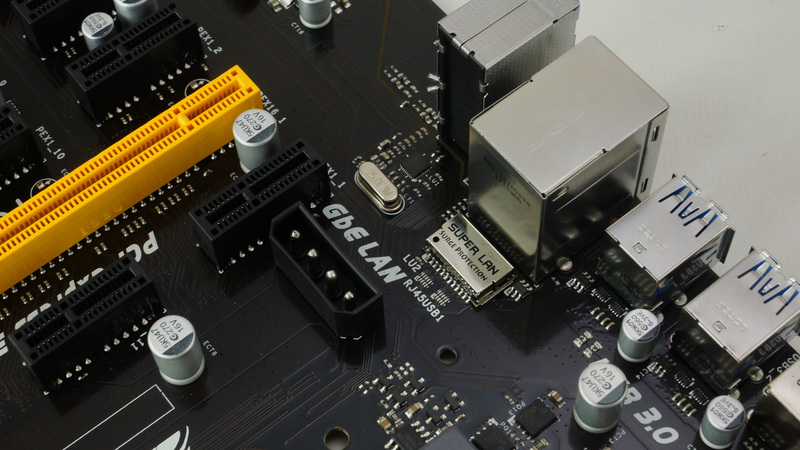 GPU-based mining has long-been the most cost-effective and most accessible way of entering this field and BIOSTAR has been one of the foundations that helped many enthusiasts as well as investors in creating platforms for this industry. 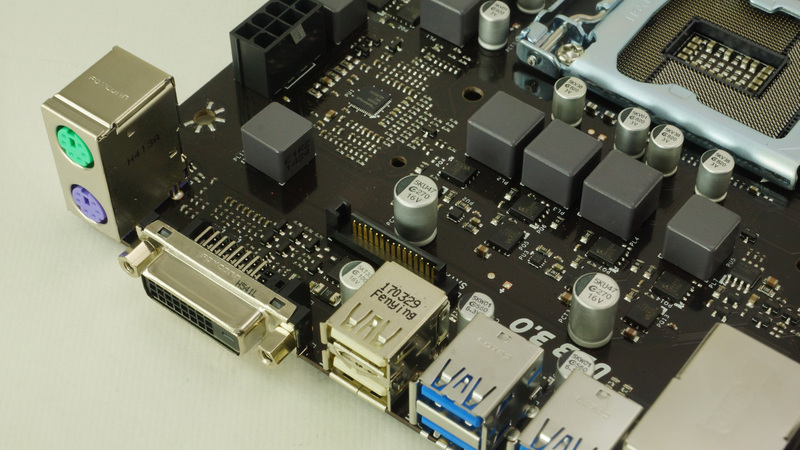 BIOSTAR since the H81A and TB85 series have been favorites by miners for its balance of price and scalability offering support up to six graphics cards for maximum board utilization. 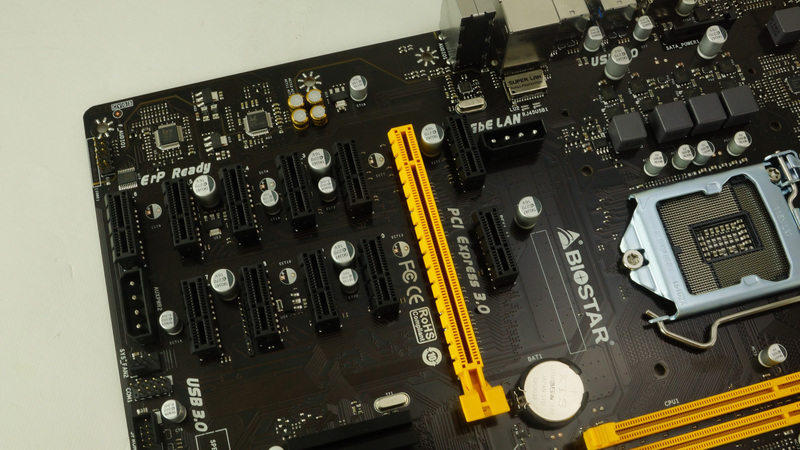 Thanks to years of professional experience in mining backed by feedback from customers as well as internal R&D, BIOSTAR has debuted its most innovative mining platform yet. 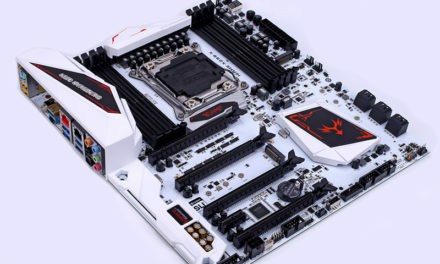 Making its debut during COMPUTEX 2017, motherboards that support up to 8 graphics cards were showcased by BIOSTAR in its booth receiving positive feedback from the people present. 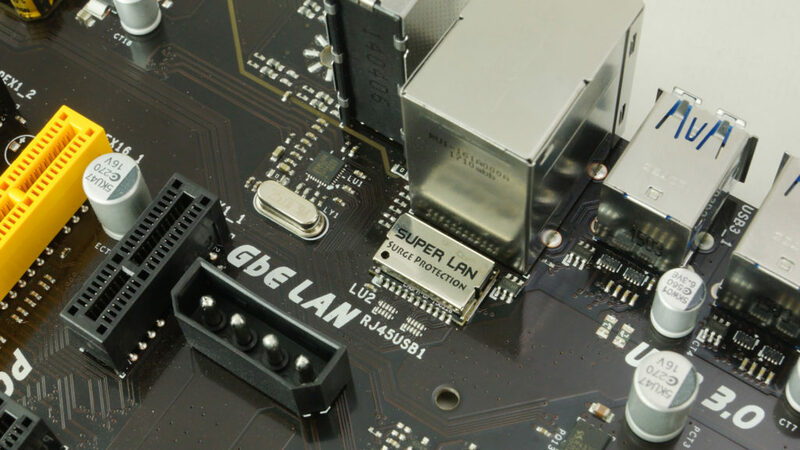 Today BIOSTAR has just up the ante with the announcement of it’s the world’s first motherboard that can support up to 12 graphics cards simultaneously with the global announcement of the TB250-BTC PRO specialized cryptocurrency mining motherboard. 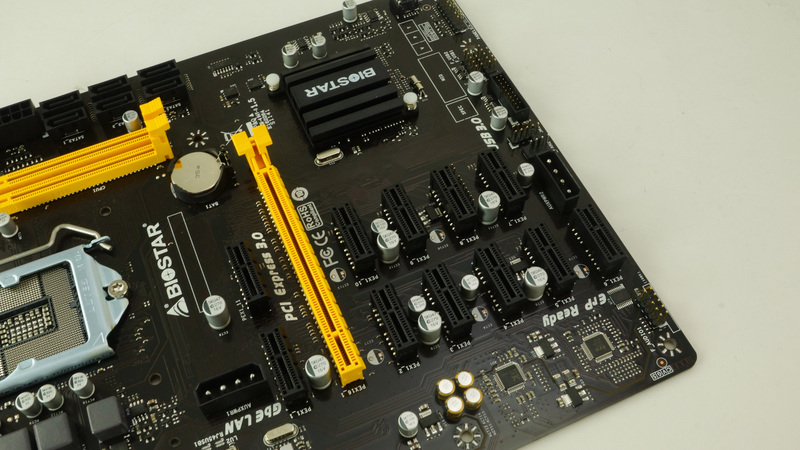 The BIOSTAR TB250-BTC PRO is the only motherboard equipped with 12 native PCI-E slots and supports both AMD and NVIDIA graphics cards for mining. 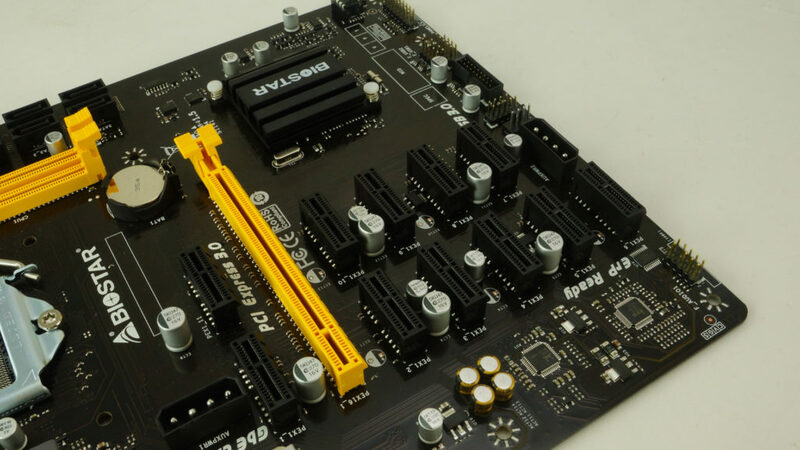 Standard motherboards have an average of 6 PCI-E slots but the BIOSTAR TB250-BTC PRO doubles that allowing up to 12 cards to be used in tandem for twice the speed and twice the board utilization allowing 200% increase in achieving your ROI. The BIOSTAR TB250-BTC PRO is the only one of its kind allowing 12-GPU mining per motherboard making it the most ideal choice for mining enthusiasts to start making money on. 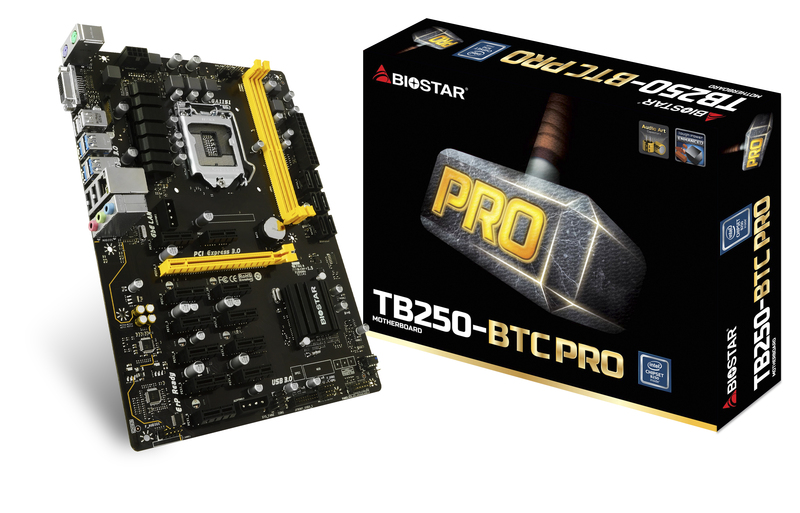 BIOSTAR have been taking feedback from mining professionals and have included their ideas into creating these products and with the BIOSTAR TB250-BTC PRO, the universal need to reduce platform cost has been addressed. With a single motherboard earning as much as two machines, a mining rig equipped with a BIOSTAR TB250-BTC PRO and populated with 12-cards is the most cost-effective and smart way to maximize each mining rig’s profitability. 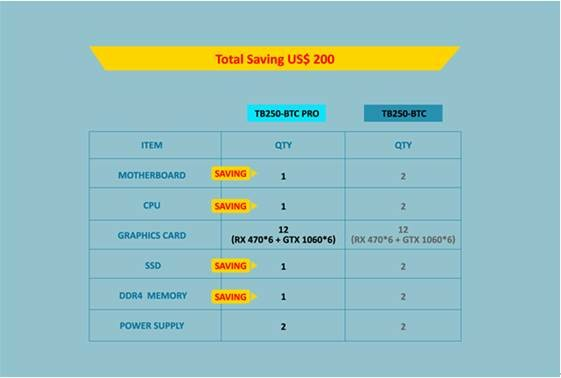 The chart below shows the savings of using a single motherboard which only requires one set of components rather than two, thus saving up to US$200 in the initial platform cost. With 12 GPUs working simultaneously on the BIOSTAR TB250-BTC PRO, this allows miners to rapidly gain their ROI faster than conventional setups. Possible rigs include 2-speed machines featuring GPUs from both AMD and NVIDIA allowing combined performance to provide miners with the ability to quickly adjust to the most profiitable virtual currency they want. See chart below for a quick comparison which shows the combined hashrate offered by a single platform powered by the BIOSTAR TB250-BTC PRO versus two rigs running different GPUs. The mining rig running TB250-BTC PRO receives a return of investment (ROI) in only 79 days versus 97 days for the separate systems. 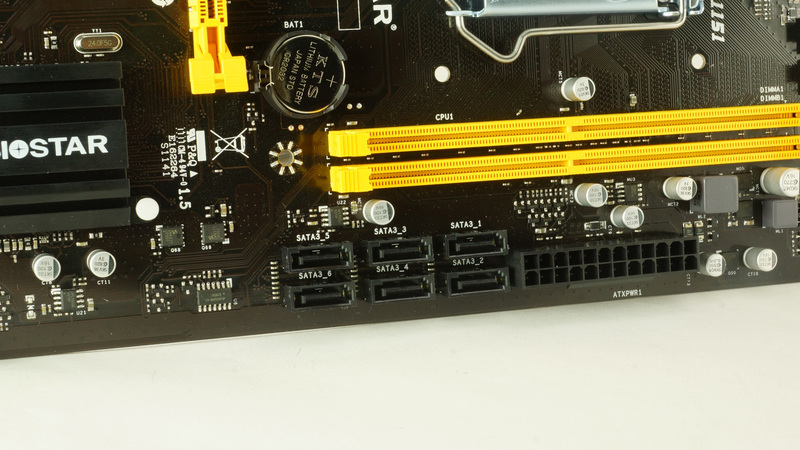 Other brands implement tight and compact arrays for their PCI-e slots making them easy to short circuit and affect stability during maintenance as well as other faults like displays not being recognized. 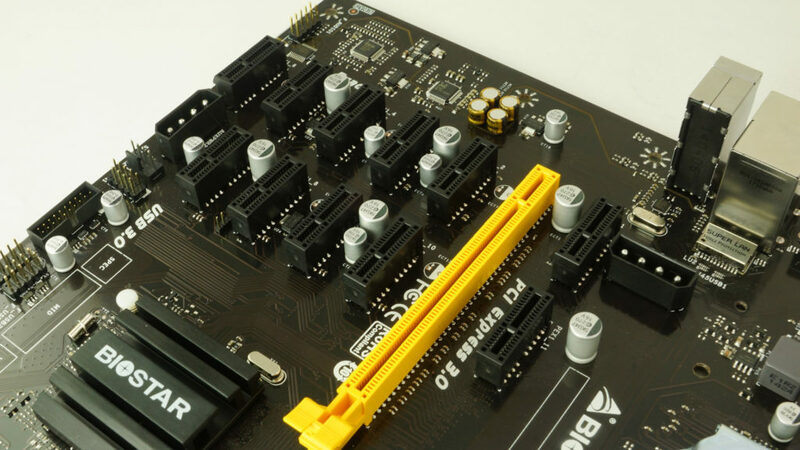 The BIOSTAR TB250-BTC PRO uses a matrix arrangment for the PCI-E slots allowing optimal and ample spacing between the slots for effective management as well as layout so each daughter card connection does not interfere with its neighboring slots. This results in more stable signals to and from the board and the devices connected to the slots. BIOSTAR also utilizes their signature PRO Series standards on the TB250-BTC PRO utilizing an all-solid capacitor setup and a rigid power management module, ensuring highly stable power delivery and operation even with 12 cards running simultaneously. We all know that the information bandwidth is like the highway, the road wider, can accommodate the more traffic, the more vehicles that won’t be hammed and can pass through. 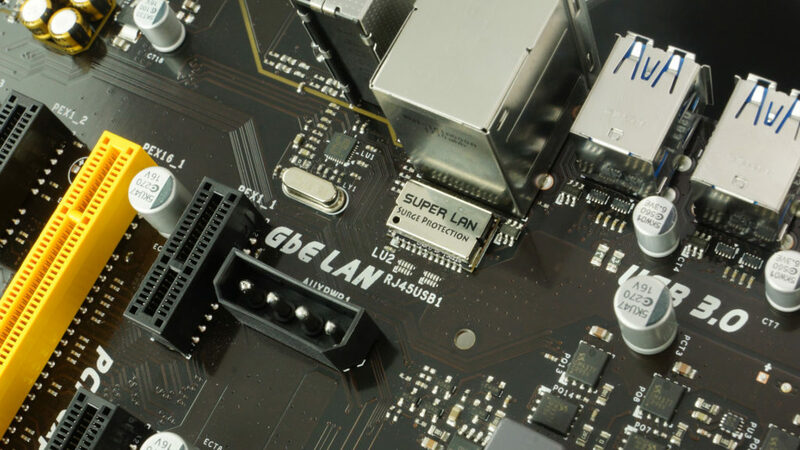 Other manufacturers utilize low-level chipset bridge thus providing a narrow passage to the graphics card being used, affecting overall system performance due to bottlenecking of each graphics card. 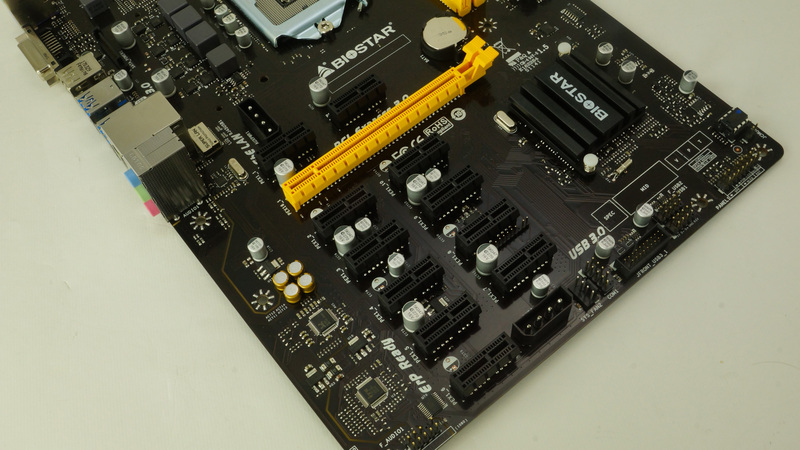 BIOSTAR addresses this by utilizing Intel’s B250 chipset allowing more bandwidth to be used and be utilized by the displays, with all 12 PCI-E groups populated. This allows all cards to work at their top-speed without any loss for the most effective setup ever. 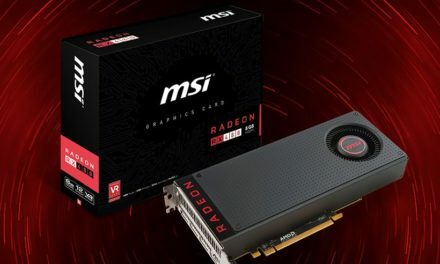 The AMD RX 470 is a rare card nowadays due to demand and its left a lot of miners craving for an alternative. In mining, time is money and and BIOSTAR addresses this by allowing the development of Hybrid Mining technology which allows the BIOSTAR TB250-BTC PRO to support multiple AMD and NVIDIA graphics cards simultaneously. 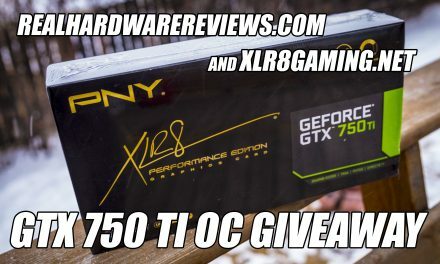 Start mining with the combined power of whatever graphics cards you have on the most profitable currency you can find and generate income while everyone else waits for their favored card. With the boom in cryptocurrency and the promise of large profits, enthusiasts around the world are in a frenzy. The mining boom four years ago was around 100P (1P = 1024T, 1T = 1024G) but that number has ballooned to more than 4000P. That is over 40 times in less than four years. This led to the rise of other cryptocurrency which has helped maintain room for improvement in the mining market. 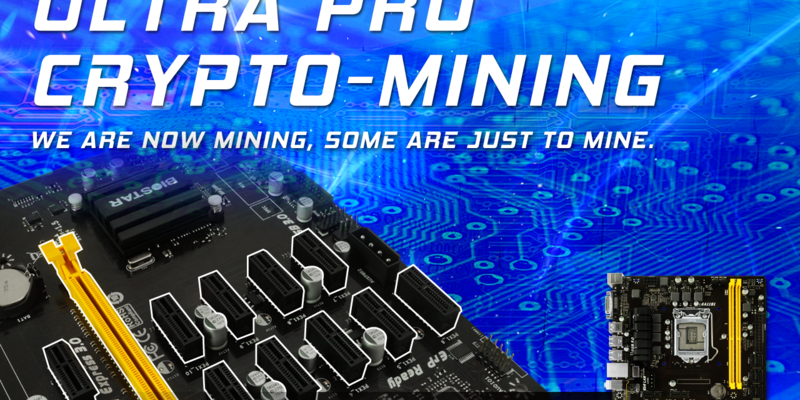 The BIOSTAR TB250-BTC PRO allows those interested to join this lucrative market to instantly become professional miners with its 12-card host system. Act now! 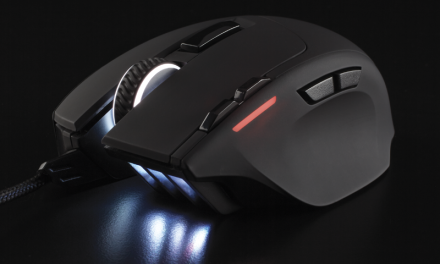 The BIOSTAR TB250-BTC PRO support legacy PS/2 ports for both keyboards and mice for those using KVMs to control multiple machines as well as a DVI display output. Plenty of USB2.0 and USB3.0 ports are present. A full 1Gbps LAN port is available as well as audio input and output ports.